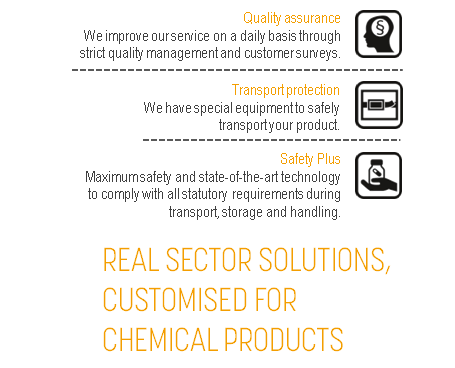 With individual precision and expertise for each sub-area, we meet all the requirements of the Chemical sector based on safety, individualised product handling and delivery in line with deadlines. We transport and store packaged bulk goods of the Chemical sector – liquids, powders and granulates. In order to guarantee the safety of the products of our customers also after production, only specially qualified JCL employees are used who regularly participate in training and further courses. Hazardous Goods Officers ensure that the goods of our customers are loaded in a way that is compliant with safety regulations and grouped according to statutory requirements and standards (e.g. SQAS etc. ).